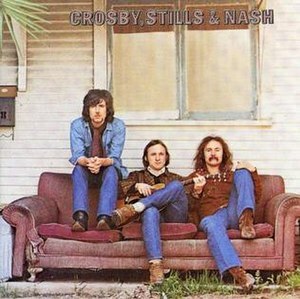 Take a look at the photo on the cover of the first Crosby stills and Nash album. For their first album, Crosby stills and Nash wanted a cover that would reflect the intimacy of the music. They wanted it to look real and natural, just like their music. While driving around Hollywood, Graham Nash spotted an old abandoned house at the corner of palm and Santa Monica boulevard. They called photographer Henry Diltz who met them there. Nothing was added to the photo…everything was there…the house, the couch, the palm. When they got the proofs back, they realized they were sitting out of order…Nash stills and Crosby. So they went back to do a re shoot…but there was no couch, no palm, no house. It had been torn down and only a pile of rubble remained. They took it as a sign and used the original shot.